Western blot analysis of extracts from various cell lines using AMFR Antibody. 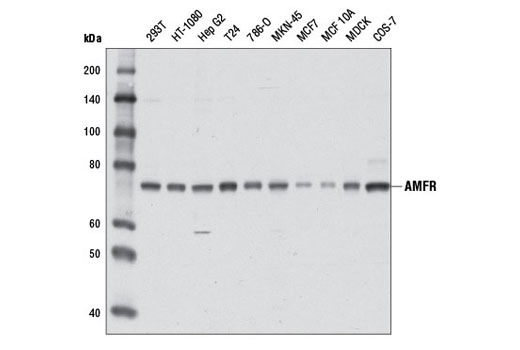 AMFR Antibody recognizes endogenous levels of total AMFR protein. This antibody does not cross-react with HRD1. Polyclonal antibodies are produced by immunizing animals with a synthetic peptide corresponding to residues near the carboxy terminus of human AMFR protein. Antibodies are purified by protein A and peptide affinity chromatography. Autocrine motility factor receptor (AMFR/gp78) is a putative seven transmembrane domain G protein-coupled receptor that functions, in part, at the cell surface as a cytokine receptor for autocrine motility factor/phosphoglucose isomerase (AMF/PGI). AMFR is also localized to an intracellular mitochondria-associated smooth ER domain where it functions as an E3 ubiquitin ligase (1). AMFR function, as both a cytokine receptor and ubiquitin ligase, is linked to a variety of cellular signaling cascades associated with metastasis development and increased invasiveness. AMFR was initially proposed to be a RING-H2 E3 ubiquitin ligase after sequence analysis identified a catalytic RING finger and CUE motif, which are responsible for ubiquitin ligase activity and ubiquitin binding, respectively (2,3). Indeed, AMFR is a key component and amongst the best characterized ubiquitin ligases of the endoplasmic reticulum associated degradation (ERAD) machinery, a process involving recognition of misfolded proteins, ubiquitination, deglycosylation, retro-translocation to the cytosol, and targeting to the proteasome (4). Recent studies have shown that AMFR plays an important role in cholesterol homeostasis via the sterol-mediated ubiquitination of HMG-CoA reductase and its cofactor Insig-1 (5,6). Furthermore, AMFR has been implicated in the degradation of apolipoprotein B100 (7). It was recently reported that AMFR degrades the metastasis suppressor KAI-1/CD-82, representing the first evidence that AMFR ubiquitin ligase activity is involved in metastasis development (8). Increased expression of AMFR correlates with a high incidence of recurrence and reduced survival in patients with bladder, colorectal, and gastric cancers (9-11). Registre, M. et al. (2004) Biochem Biophys Res Commun 320, 1316-22. Shimizu, K. et al. (1999) FEBS Lett 456, 295-300. Ponting, C.P. (2000) Biochem J 351 Pt 2, 527-35. Meusser, B. et al. (2005) Nat Cell Biol 7, 766-72. Song, B.L. et al. (2005) Mol Cell 19, 829-40. Lee, J.N. et al. (2006) J Biol Chem 281, 39308-15. Liang, J.S. et al. (2003) J Biol Chem 278, 23984-8. Tsai, Y.C. et al. (2007) Nat Med 13, 1504-9. Hirono, Y. et al. (1996) Br J Cancer 74, 2003-7. Nakamori, S. et al. (1994) Cancer 74, 1855-62. Otto, T. et al. (1997) Am J Pathol 150, 1919-23.